Greek electronic dictionary and language translators. Greek - other languages dictionaries. Greek electronic dictionary and language translators. 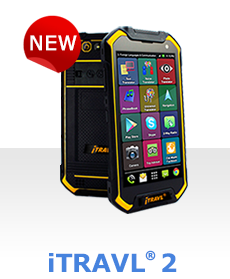 Raising the bar on smartphones, the ECTACO English <-> Greek iTRAVL 2 is the perfect tool for a world traveler, language learner, or someone who just needs a superior, rugged Smartphone. With the ability to receive FREE incoming calls in over 160 countries with NO CONTRACT it's easy to stay in touch with friends and family when you travel. 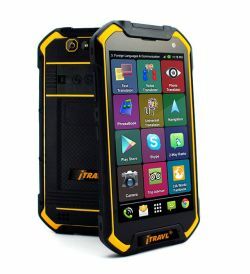 Loaded with everything you need for making sense of your world in a foreign land, the iTRAVL 2 comes with a voice translator, picture translation, travel information, voice recognition and a Language Teacher to name very select few. 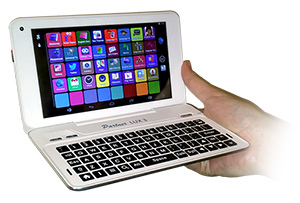 It's even been called the "Panasonic Toughbook" of the smartphone world! 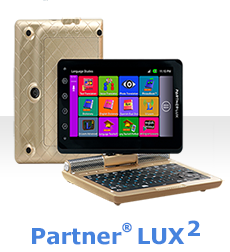 The Ectaco Partner LUX 3 English <-> Greek Free Speech Translator features an unbeatable combination of the expansive and powerful Android operating system and Ectaco's proven language learning and communication suite. At the forefront is the LUX 3's incredible ability to translate free speech between English and Greek. 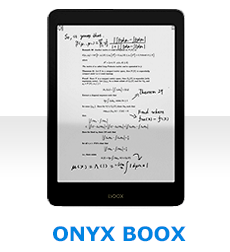 The LUX 3 also includes a full text translator for translating words, sentences, or phrases. Combined with the audio phrasebook with 14,000 phrases and a real native speaker voice, language barriers will cease to exist when travelling. For learning a language, the device is loaded with the Ectaco Language Teacher which has multiple levels of teaching capabilities. This includes a beginner to advanced progression from alphabet to words to phrases to dialogues. This program will recognize your voice and help correct your pronunciation as well. The LUX 3 has many more fully fledged features including an English and Greek dictionary with 629,000 words and phrases, as well as the UT183 translator with translation to and from 183 different languages. Additional features include lots of games, an eBook reader, a talking picture dictionary, grammar courses, preparation for many common language tests, and much more. Partnered with the Android operating system and the ability to be expanded with any apps, the possibilities for the Ectaco Partner LUX 3 English <-> Greek are limitless! The ECTACO Partner EG900 combines an enormous 509,000 entry Translating Dictionary, a simple to use bilingual translating Picture Dictionary, a complete English explanatory dictionary and Full Text Translation, into one remarkable handheld that delivers flexible English and Greek translation and communication opportunities. Providing voice-perfect spoken output of all the words in its colossal database using True Voice human pronunciation, the 900 employs the world's most advanced Speech Recognition modules to let you speak in one language and get an instant, hands-free translation spoken back in another. Featuring a 14,000 phrase talking, translating Audio PhraseBook to provide all the words and phrases you need for perfect communication in almost any situation, the 15 easy to navigate topic areas let you say just about anything at all. A built-in Language Teacher system offers access to one of the most effective methods ever designed for language learning through a combination of True Voice and Speech Recognition modules and easy to follow, step-by-step lessons with enjoyable games and exams that take you from beginner to advanced speaker in no time at all. Our popular jetBook Reader lets you read and translate your favorite e-Books while a built-in voice recorder, an audio player with mp3 support and an FM radio keep you entertained and informed. And extras like a Calendar, World Time clock, and Calculator and Metric Conversion utilities help you stay organized while saving you time and money. 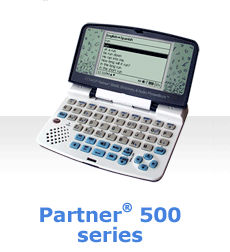 The ECTACO Partner EG500 is a unique bilingual translating dictionary that combines the most practical linguistic resources in a single handheld to let anyone understand and communicate instantly. Featuring all the latest programming advances and the fastest search utilities on the market, it contains a massive 94,160 word vocabulary plus 14,000 of the most important phrases for immediate communication. The latest TTS (Text-To-Speech) voice synthesis modules allow the 500 to speak any of its entries aloud to deliver complete pronunciation of all the entries in the database so you will always know just how a word should be said. Unlimited voice output also means that the device will say any word at all that is entered via the comfortable and intuitive keypad. A perfect choice for anyone who needs on-the-spot translations of English and Greek words and phrases, the user-friendly bilingual interface makes navigating through the vast amounts of information simple and easy. In addition to the superior dictionary functionality, the 500 also contains SAT 200 and SAT 5000 vocabulary builders to help you prepare for standardized SAT tests. The inclusion of common American idioms, a complete English grammar resource with irregular verbs, and enjoyable linguistic games round out the comprehensive resources to let you improve your skills quickly and accurately. Pre-loaded with all the extras usually found in more expensive business organizers, a World Time utility helps you stay on schedule no matter where you are, while the built-in Calculator, Currency and Metric Converters let you take charge of your finances. 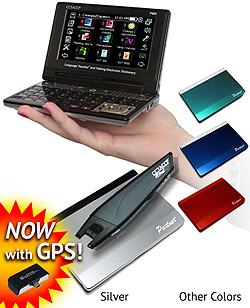 Wrapped up in a stylish and robust package that will get envious glances whenever you pull it out, an easy to read 255x160 LCD display lets you enjoy the device for hours on end without the eyestrain that comes from using other screens. The ECTACO Partner C-4G is a complete reading and translation handheld designed to let you experience the pleasure of reading like never before. Featuring two hinged, high-quality screens that look and feel just like a real book, it offers the ability to store thousands of you favorite books and translate the words you don't know in a fraction of a second. Now alongside your favorite reading material you have instant access to a massive translating dictionary featuring 505,000 entries including specialized, professional terms used by the legal, medical and IT professions. In addition, the C-4 is able to speak all of the entries found in its dictionaries - indeed any word you type into it - with its unlimited TTS (Text-to-Speech) voice functionality. In addition, the C-4 comes pre-loaded with 14,000 phrases for commonly encountered situations and can even these important first-use phrases using perfectly audible, digital recordings of real human narrators. In addition to the linguistic resources packed into the device, the C-4 is also fully customizable and expandable and is able to keep up with the demands of even professional users. As an added benefit, the standard C-4 package also comes with a free bonus CD that contains more than 150 linguistic applications that includes translating Dictionaries, FlashCards and PhraseBooks for 39 languages to help improve your knowledge of some of the world's most popular and useful languages. 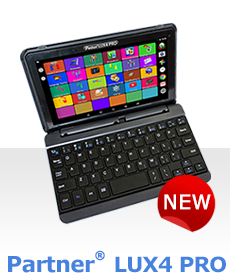 The ECTACO NTL-2G is the world's only 2-way, hands-free translation and travel device that makes any trip you take more enjoyable and succesful by providing instant translation between English and Greek. With a unique combination of accurate speech recognition modules that understand what you say, amazingly clear and intelligable voice output as narrated by native speakers and some of the most accurate and intelligent databases around it is a real communication powerhouse unlike anything that has ever existed before. Featuring the most remakable combination of linguistic utilities ever assembled in a single device the NTL offers everything the smart traveler needs to understand and be understood in any situation - even in emergencies. The inclusion of reliable and up-to-the-minute travel information from the CIA World Factbook makes NTL devices not only superb translators but also provides dependable information on the world's top destinations including maps, transportation, local attractions and even restaurant and hotel recommendations. With an interactive language learning system, an mp3 player for your media files, talking conversion calculators and other travel essentials it is the ultimate travel companion that keeps on delivering long after you return home and to let you prepare for your next trip abroad. The ECTACO NTL-19EE is the world's only 2-way, hands-free translation and travel device that makes any trip you take more enjoyable and succesful by providing instant translation between English, Greek, Armenian, Bosnian, Bulgarian, Croatian, Czech, French, German, Greek, Hungarian, Italian, Polish, Portuguese, Romanian, Russian, Serbian, Slovak, Spanish, Ukrainian. With a unique combination of accurate speech recognition modules that understand what you say, amazingly clear and intelligable voice output as narrated by native speakers and some of the most accurate and intelligent databases around it is a real communication powerhouse unlike anything that has ever existed before. Featuring the most remakable combination of linguistic utilities ever assembled in a single device the NTL offers everything the smart traveler needs to understand and be understood in any situation - even in emergencies. The inclusion of reliable and up-to-the-minute travel information from the CIA World Factbook makes NTL devices not only superb translators but also provides dependable information on the world's top destinations including maps, transportation, local attractions and even restaurant and hotel recommendations. With an interactive language learning system, an mp3 player for your media files, talking conversion calculators and other travel essentials it is the ultimate travel companion that keeps on delivering long after you return home and to let you prepare for your next trip abroad. 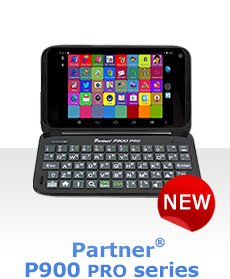 The ECTACO English <-> Greek Partner PB-Gr B-3 has been designed specifically with the international traveler in mind. Going with you wherever you go, it lets you communicate in English and Greek with little or no previous experience. Remarkable for its sophisticated voice functions, it is able to pronounce any of its more than 14,000 travel-related phrases as narrated by native speakers in crystal-clear digital recordings. That means that you need no longer sound out foreign words or risk being misunderstood because of mistakes or accents. Acting as your personal interpreter, the B-3 will help you to be successful when visiting a bank, shopping, sightseeing, going to the hairdressers or post office and much, much more. Divided into 15 easy to search topic categories this handy device makes it simple to find what you want when you want it - saving you time and energy and letting you get your message across in almost any situation. These robust portable handheld translation devices are your window on to foreign language and culture, and the prefect solution for anyone who wants to understand - and be understood. The ECTACO French <-> Greek Partner FGr B-3 has been designed specifically with the international traveler in mind. Going with you wherever you go, it lets you communicate in French and Greek with little or no previous experience. Remarkable for its sophisticated voice functions, it is able to pronounce any of its more than 14,000 travel-related phrases as narrated by native speakers in crystal-clear digital recordings. That means that you need no longer sound out foreign words or risk being misunderstood because of mistakes or accents. Acting as your personal interpreter, the B-3 will help you to be successful when visiting a bank, shopping, sightseeing, going to the hairdressers or post office and much, much more. Divided into 15 easy to search topic categories this handy device makes it simple to find what you want when you want it - saving you time and energy and letting you get your message across in almost any situation. These robust portable handheld translation devices are your window on to foreign language and culture, and the prefect solution for anyone who wants to understand - and be understood. The ECTACO German <-> Greek Partner DGr B-3 has been designed specifically with the international traveler in mind. Going with you wherever you go, it lets you communicate in German and Greek with little or no previous experience. Remarkable for its sophisticated voice functions, it is able to pronounce any of its more than 14,000 travel-related phrases as narrated by native speakers in crystal-clear digital recordings. That means that you need no longer sound out foreign words or risk being misunderstood because of mistakes or accents. Acting as your personal interpreter, the B-3 will help you to be successful when visiting a bank, shopping, sightseeing, going to the hairdressers or post office and much, much more. Divided into 15 easy to search topic categories this handy device makes it simple to find what you want when you want it - saving you time and energy and letting you get your message across in almost any situation. These robust portable handheld translation devices are your window on to foreign language and culture, and the prefect solution for anyone who wants to understand - and be understood. The ECTACO Russian <-> Greek Partner RGr B-3 has been designed specifically with the international traveler in mind. Going with you wherever you go, it lets you communicate in Russian and Greek with little or no previous experience. Remarkable for its sophisticated voice functions, it is able to pronounce any of its more than 14,000 travel-related phrases as narrated by native speakers in crystal-clear digital recordings. That means that you need no longer sound out foreign words or risk being misunderstood because of mistakes or accents. Acting as your personal interpreter, the B-3 will help you to be successful when visiting a bank, shopping, sightseeing, going to the hairdressers or post office and much, much more. Divided into 15 easy to search topic categories this handy device makes it simple to find what you want when you want it - saving you time and energy and letting you get your message across in almost any situation. These robust portable handheld translation devices are your window on to foreign language and culture, and the prefect solution for anyone who wants to understand - and be understood. The ECTACO Spanish <-> Greek Partner SGr B-3 has been designed specifically with the international traveler in mind. Going with you wherever you go, it lets you communicate in Spanish and Greek with little or no previous experience. Remarkable for its sophisticated voice functions, it is able to pronounce any of its more than 14,000 travel-related phrases as narrated by native speakers in crystal-clear digital recordings. That means that you need no longer sound out foreign words or risk being misunderstood because of mistakes or accents. Acting as your personal interpreter, the B-3 will help you to be successful when visiting a bank, shopping, sightseeing, going to the hairdressers or post office and much, much more. Divided into 15 easy to search topic categories this handy device makes it simple to find what you want when you want it - saving you time and energy and letting you get your message across in almost any situation. These robust portable handheld translation devices are your window on to foreign language and culture, and the prefect solution for anyone who wants to understand - and be understood.